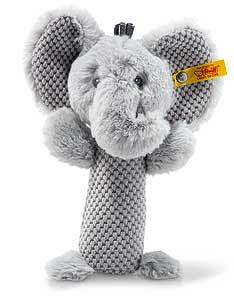 Ellie Elephant Rattle is from the new Steiff Cuddly Friends collection and made in beautiful grey cuddly soft plush and wears the famous stainless steel button in ear with yellow tag edition. Season launch: 2017 Safe for baby. All textiles in the Steiff Baby toys and gifts range are tested for no harmful substances and certified by the standard Oko-Tex Standard 100 for child safety.